Today I'm guest blogging across on Lindsay's Romantics about my Native American Beneath The Shining Mountains. For once I've included images of reproduction artefacts from my days as a re-enactor. The blog is part of a three author series - The Lindas - where we talk about why we chose to write in our particular sub-genre. It finishes Friday, so do call across if you have time. 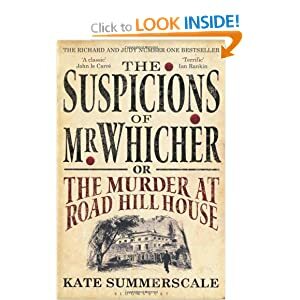 It's not often that I review books on this blog, but this one begs to be an exception: The Suspicions of Mr Whicher - or The Murder at Road Hill House by Kate Summerscale is hardly new (2008) - I read the updated 2009 copy, and it well deserves the many accolades and awards it has garnered. It is truly fascinating on so many levels. On the night of 30th June 1860 the Kent family and live-in servants retire for the night. By the next morning one of their member, a child, has been brutally murdered, and all eyes in the quiet Wiltshire village of Road turn to the seemingly respectable family living in the grand, secluded house. If that sounds like a typical Victorian whodunnit, please be aware that this is no work of fiction. This book, written in extremely accessible language, is a biography not just of a murder, but of London's fledgling detective service, of Victorian attitudes and class snobbery, and, so pertinent to our own time, trial by media - newspapers and journals in this case - as the unsolved case took the country by storm. It became the event that launched the Victorian country house murder genre - The Moonstone by Wilkie Collins (1868), generally regarded as the first British detective novel, mirrors the case so closely as to make modern writers shudder. Charles Dickens is another celebrated author who we see in a less than golden light. How members of the family, and their servants, managed to survive the emotional and physical strain is beyond me. But it was the author's postscript to the 2009 edition that touched me most, bringing the Kent family into sharp, very human, relief. Kate Summerscale is a fine writer and obviously has more than a touch of the detective about her, going by her research. For those interested in this period of English Victorian life the book is a veritable mine of information, all backed up by 50+pp of index and chapter notes, a fascinating read in themselves. 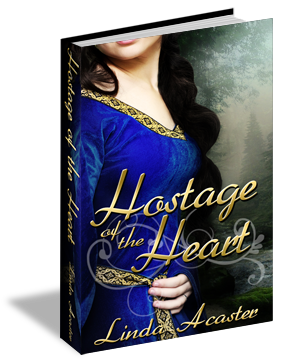 My Mediaeval Romantic Suspense Hostage of the Heart now has a bright new cover from Karri Klawiter. It's live on Amazon and Smashwords, and will be feeding through to other stockists in the next week or so. By way of celebration, today the novel has a spotlight on BlurbsInBloom. Do go across and give it a Tweet (it's the new hug, y'know). The site uploads covers & blurbs in Sweet and Sensual Romances, so if you are wanting to add to your TBRead list without having to wade through masses of x-rated blurbs, this is a good site to bookmark. Have a great reading day!